Maybe it’s our rugged independence or our plucky determination to make do with what we’ve got. Whatever the reason, Colorado communities and developers seem to be choosing fixer-upper projects over new builds more than ever — and embracing the inherent challenges with staggering creativity. From a flourishing arts center in a former power station to an elementary school turned gourmet food hall, see for yourself how Colorado’s time-worn stories enrich today’s ventures. Public markets and food halls are naturally adept at bringing people together and energizing neighborhoods. Several in Colorado have taken that communal spirit and applied it to the art of reviving historic or abandoned buildings in the process. That’s just what’s happened at Ivywild School in Colorado Springs. The former elementary school has been transformed into a culinary destination, thanks to a craft cocktail and espresso bar (cleverly dubbed The Principal’s Office), bakery, brewery and deli. Come for the food and stay for live concerts in the gymnasium. Similarly, The Source has singlehandedly spurred new vivacity on Brighton Boulevard in Denver, after reviving a 19th-century steel foundry. Inside the lofty brick behemoth, foodies enjoy a one-stop shop, complete with a coffee shop, a bakery, a butcher, a cocktail bar, restaurants, a sour-ale brewery and a handful of other upscale purveyors. A similar endeavor is underway at Stanley Marketplace, which overhauled the 1954 Stanley Aviation hangar in Aurora. The incoming vendors established a “Stanifesto” that embraces the spirit of Bob Stanley, local aviation innovator and the first American to fly a jet plane. The marketplace keeps it fresh with tours, art shows, interactive comedy, and vendors for everything from bagels and coffee to yoga classes and haircuts. 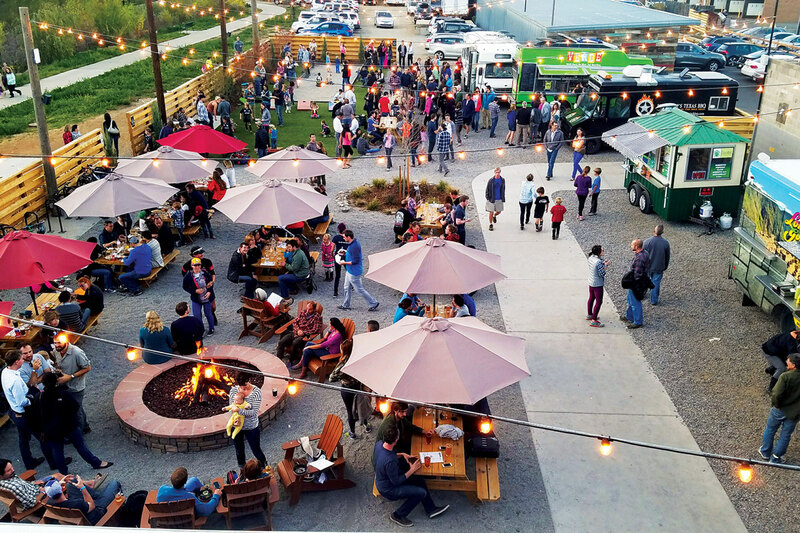 The old Rayback Plumbing building in Boulder was recently reincarnated as the Rayback Collective food-truck park, with the region’s best food trucks on regular rotation. Beloved for its backyard-like vibes — complete with firepit, live music and yard games — you might while away an entire afternoon here admiring views of the Flatirons Mountains, beer in hand. Another Cinderella story is underway at the 1905 Feeders Supply store in Fort Collins’ River District. Ginger and Baker is giving the shop a makeover, turning the charming red-and-white checked building into a gourmet market, pie shop, café and cooking school. A grand opening is scheduled for late 2017 (check the project’s progress here), but the project has not come without obstacles, including the discovery of a molasses pit needing removal from the basement (molasses was once mixed with grain for livestock feed)! Ginger and Baker follows the momentum of Fort Collins’ Jessup Farm Artisan Village, which lovingly converted a turn-of-the-century farmstead into a collection of shops and eateries, including the 133-year-old, red brick restaurant, The Farmhouse. Stop by the village for a latte, a beer, a haircut or farmhouse-inspired home décor. Because they demand a large footprint, attractions often choose to start fresh and build new. But several innovative organizations across the state are proving that embarking on a facility rescue can enrich the experience in the end. In its glory days, the building that now houses Durango’s Powerhouse Science Center was one of the earliest AC electric plants in the country and helped power Colorado’s entire Western Slope. After shuttering in the 1970s, the building became an eyesore on the banks of the Animas River. Today, a handsome restoration has redeemed the building. And a children’s science discovery offers hands-on exhibits, including rocket building, topographical touch-tables and climbing walls that encourage little ones to burn off some energy of their own. Another great place for kids to get the lead out? A trampoline park and adventure center in Grand Junction called Get Air Silo. 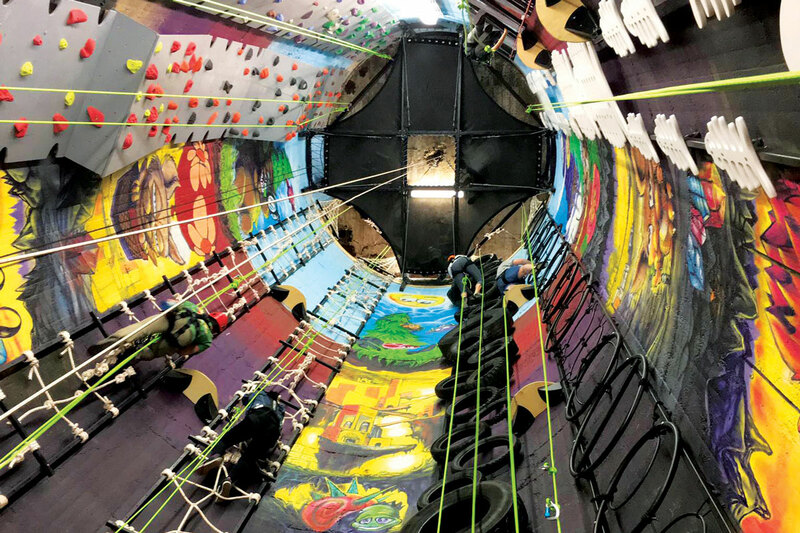 In addition to wall-to-wall trampolines, a “ninja” course and foam pit, two of the property’s 1970s-era silos — each 85 feet tall and 16 feet in diameter — have been cleverly repurposed: a Silo Cave Tour will have you climb up one silo (using rings and car tires fastened to the walls) and bungee jump down into the darkness of another. Adults unfettered by young ones might opt for a quieter, more cerebral undertaking. The Rocky Mountain Land Library fits the bill. Jeff Lee and Ann Martin, two longtime bookstore employees who have stockpiled some 32,000 natural history books over the years have leased a historic ranch (dating back to 1862) in South Park as the site of their ambitious library. Renovations at Buffalo Peaks Ranch are ongoing, but visitors can already participate in workshops on poetry, ecology, botany, painting and more — or simply come to soak up the invigorating Southwestern landscape that inspired so many of the books in Lee and Martin’s collection. Sometimes a reno project seems like it was meant to be. We can’t imagine a better place to display a collection of Western art than a grand old, Western-style dry goods shop in downtown Trinidad. The A.R. Mitchell Museum has brought this vintage gem back to life and filled it with artist Arthur Roy Mitchell’s work and collected pieces on subjects like cowboys, horses, cattle and frontier landscapes. The horseshoe-shaped mezzanine is something to behold, and the building’s original pressed-tin ceilings and wood floors are beautifully intact. Why dine at an ordinary restaurant when you could discover a place with fascinating history? Take Ophelia’s Electric Soapbox in Denver. Nevermind this historic building’s lowly pedigree (as a brothel and adult bookstore). The restaurant has revived the 1894 building to grandeur with its raved-about, high-end “gastrobrothel” cuisine and playful décor that gives a nod to its past life. Look for boudoir posters, a bar made of pinball machine tops, and a mezzanine that voyeuristically gazes down on a curtained stage. Now to a Denver landmark with a much higher profile. The original air-control tower of Denver’s first international airport, Stapleton (which the city outgrew in the 90s) still stands sentinel over the area. For decades, it languished, abandoned and graffitied. Local restaurateurs have reclaimed the base of the tower, turning it into the lively Punch Bowl Social, with bowling, beer, cocktails and refined pub fare (opening late October 2017). Further up Colorado’s Front Range, in Longmont, the local newspaper may have packed up and relocated to Boulder, but its former headquarters are newly abuzz — this time with folks swilling Colorado ciders at the St. Vrain Cidery (where the Daily Times-Call sign still hangs proudly above steel cider barrels) and sipping spirits at Abbot & Wallace Distillery. Is it just us, or does music sound better in a patinaed old building? And doesn’t visual art demand a space with a story? Coloradans sure seem to think so — including the folks in Alamosa who recently converted a former Christian Science Reading Room to an intimate music venue called Society Hall. With rich woods, warm acoustics and gently curving walls, the place seems made for music. Musicians seem to agree, judging by the steady stream of talented folk musicians, rock bands and singer/songwriters who come through the venue. Taking acoustics to an entirely new level is the TANK Center for Sonic Arts in Rangely. Called “one of the world’s sonic wonders,” the tank was once known only to residents of this far-flung northeastern Colorado town. But word spread, and eventually a community of sonic artists banded together to preserve it. Structurally, it’s just what it sounds like: a huge, rusty, abandoned water tank. But inside, every little sound takes on a life of its own. Hear the phenomenon firsthand during a concert, special event or visiting hours (Saturdays 9am–1pm, May–October). Locals are best at reimagining old facilities, and because Salida is one of 21 Certified Creative Districts in Colorado, it should come as no surprise that the town’s residents saw a rundown, riverside power plant as the perfect blank canvas for an arts and event center. The 1887 brick building that was originally the Salida Edison Electric Light Co. is now the Steamplant Event Center, drawing guests to its scenic riverside location for community gatherings, art showings, movie screenings, live music and a sculpture garden.